The new Sandy Hook Elementary School: Designing and building the Newtown elementary school. An architect and a town design a school that embraces Newtown’s connection to the natural world. 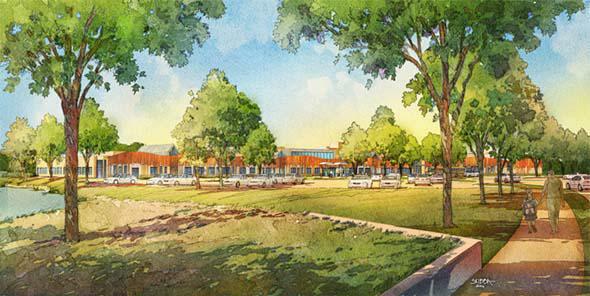 A rendering of the new Sandy Hook Elementary School. As you enter Newtown, Connecticut, the town appears suddenly out of rolling canopies of changing foliage. The spire of a church and the tower of the town hall poke through the trees. During workshops to discuss the redesign of Sandy Hook Elementary, this was the image that emerged as the inspiration for the new school. This fall the construction company Consigli began preliminary work on the site, packing down the sandy dirt from which Sandy Hook gets its name. The new elementary school is expected to cost $50 million and will serve 500 pre-K through fourth-grade students. Its design has been a challenge, and Newtown’s First Selectwoman—the town’s equivalent of a mayor—Pat Llodra told me that she, like everyone in the town, will forever have mixed feelings about it. “We want to be celebratory and excited about this new school,” Llodra said, “but we are where we are because of the loss of 26 beautiful people.” The architects, Svigals + Partners, worked closely with the community to create a unique design by drawing inspiration from Newtown’s natural landscape. But they also hoped to do something more audacious: to create a school where, though the name Sandy Hook conjured images of trauma, any parent anywhere would be eager to send his or her child. The redesign of Dickinson Drive brings traffic in at the very north and center of the site, allowing a clear panoramic view as you enter. Llodra set up a task force of 28 people from the town’s various boards and hired a facilitator from the Harwood Institute for Public Innovation, a Washington-area consulting firm specializing in community problem solving. She also hired a group of engineers, land rights experts, and architects to begin exploring alternative sites. But nothing was quite right; some sites didn’t have the right utilities, others were too expensive, and others were too far away. The team began exploring whether they should remodel the current building. The killings took place in classrooms near the front of the school, but removing these classrooms and remodeling proved as expensive as starting from scratch. In this way, some of the hardest decisions were made for them. They decided to build on the current site, but on a different footprint. The state of Connecticut offered $50 million to rebuild the school, which the town voted overwhelmingly to accept for that purpose. Of more than 5,000 votes cast, 4,504 voted yes. With this decision made, the group began to take bids from architects from all over the country. Robert Mitchell, the chairman of public buildings for Newtown, told me that the committee spent more than 400 man-hours sorting through the potential architects. It was a high-profile and challenging project, and many architects who would not normally consider public works wanted to participate. But Svigals + Partners stood out. In an interview with the task force, Barry Svigals, a New Haven, Connecticut, architect, told the task force, “No one can tell you what this school should be like.” Svigals’ willingness to listen led the town to choose his firm, says Mitchell, who is also the parent of Sandy Hook Elementary graduates. “They just seemed exceptionally sensitive. They saw that this was not just a school but a part of the healing process,” he said. Svigals’ firm ran workshops, which were open to the public, to discuss the project. The workshops drew on a cross-section of the town: people who lived there, teachers, administrators, the chief of police, and first responders. Sometimes the group of roughly 50 would meet in the middle school library sitting in rocking chairs, other times in the high school auditorium. These meetings helped make those participants ambassadors for the project, able to explain to neighbors and friends in their own words why certain decisions were made. One of the most contentious of those decisions regarded the entrance road to the school. The old Sandy Hook school was not visible from the road, but was reached via a long driveway, called Dickinson Drive. Llodra explained, “There were really sensitive associations with Dickinson Drive.” When bullets began flying at the school, children escaped by running down Dickinson Drive and hiding in neighbors’ houses nearby. At the bottom of the road sits the firehouse where some parents were reunited with their children, and where others stood waiting for children who would never come walking down Dickinson Drive. What to do with this charged space? No answer feels entirely satisfactory. Llodra and her team tried to purchase a house next door to the property so that they could build a new entrance, but the owners didn’t want to sell. The compromise: The first third of the road is the same as the old one, and a new spur road creates a loop leading to the entrance of the school so that the setting feels entirely new. Dickinson Drive is emblematic of the balance that Llodra talks about. They work with what they have, and they remember why they are here, but they move forward. When I asked Jay Brotman, the project’s design lead, what building inspired the school’s design, he said it wasn’t inspired by a building at all, but by nature. Brotman said that the idea originated with the town, and early in the design process Svigals brought on Stephen Kellert, a longtime friend and social ecologist at Yale, as a design consultant. In meetings, one image popped up again and again, Svigals said: the entrance to the town and its seamless integration with the surrounding trees and landscape. Svigals and his team decided to draw on this feature in the facade of the school, which is set into the woods. In front of the school are two groves of trees. The facade of the school is on a soft curve, with the building’s wings reaching out like arms to embrace the children, Svigals explained. Spokes come off the main building to form “treehouses” or classrooms set in the woods. About 500 students will be distributed between three classroom wings, two of which are two stories and extend like fingers of an open hand. At the front of the school, there’s a bioswale, or what the design team calls a “rain garden.” It looks more like a dry marsh, with reedy wetland plants, than a formal garden. Rainwater will be collected on the roof and then run through the plantings in front of the school. The plants act as a drainage course that removes silt and pollution from runoff water before it is reintroduced to the ecosystem. Julia McFadden, the project’s manager, and Brotman explained that this balance was constantly on their minds, and for this reason, many of the security mechanisms are not noticeable. Each classroom can be completely secured. The design team used hardened glass in the sidelights, capable of withstanding ballistic-level force. The walls, too, are hardened—though McFadden was quick to point out that this is true of many modern schools. Looking at the classroom, you would never notice, though. “We spent a lot of time making sure it looked like every other school in the country—except more beautiful,” Brotman said. 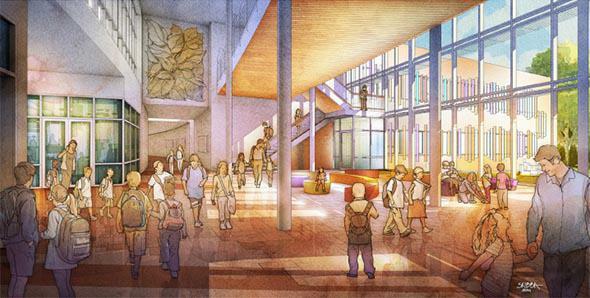 From the main central lobby, vistas of nature appear between the classroom wings, connecting the inside and outside with treelike columns. The visual focus is instead on the school’s connection to nature; I thought of it, when talking to the architectural team and people in the town, as a gesture to life. In three different spots on campus, students cross waterways on bridges. This is a gesture to Newtown’s ecological position but also to an increasing awareness of nature’s benefits for children both in terms of learning and well-being. A 2004 study of 400 students by the U.S. Fish and Wildlife Service and the University of Florida found that nature education significantly boosted student motivation, and according to the State Education and Environmental Roundtable, students in nature-based programs performed better than their peers who did not engage with nature. In 2011, researchers at the University of Illinois at Urbana-Champaign found that increased time spent outdoors was linked to milder ADHD symptoms. The new school is, in many ways, a physical manifestation of a town’s response to tragedy. It is an optimistic look at the future, one which seeks to encourage children to play and learn outside, to embrace life and the place they live—and it is a rejection of fear. It is slated to open in the fall of 2016, and then the design and the town’s vision of the future will be tested. Currently 359 students from the district are attending one of the temporary alternatives to Sandy Hook, down from 454 students at Sandy Hook in October of 2012, before the shooting. On the one hand, Llodra says, she hears people are moving to Sandy Hook to have access to this state-of-the-art school; on the other, the stigma may persist.